Foreword: For people who gather lots of Blu-ray or DVD movies at home, it’s necessary to own a Blu-ray/DVD ripping program. 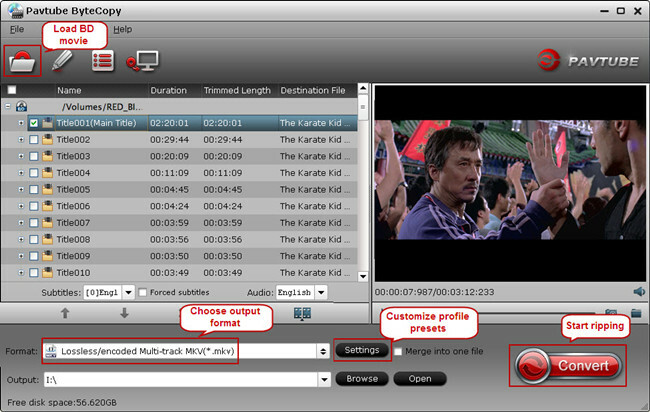 A such tool could help users to copy/rip or convert Blu-ray and DVDs and keep multi-track for different uses. If you just don’t have one, this article must be useful for you. In which, i will introduce a wonderful multi-track Blu-ray/DVD Ripper for you. However, this Multi-track Blu-ray/DVD Ripper does not only everything (selection of forced subtitles is excluded from the “everything” ) MakeMKV does, but also converts/encodes Blu-ray contents. It could rip and convert Blu-ray/DVD to any video format you like. Or directly convert your Blu-ray or DVD to your tablet or smartphone with best video quality. In other words, there are many presets for tablets and phones in output format list, which are designed according to the device’s configuration, like Surface 5, Surface Pro 4, Galaxy S7/S7 Edge, Galaxy TabPro s, Galaxy Note 5, Kindle Fire HDX, Google Nexus 9/Nexus 10, Asus PadFone, Transformer Pad infinity, Apple iPad Air 3, iPad mini 4, iPhone SE, Apple TV 4 and more. Overview: Pavtube ByteCopy is your best tool to rip and convert Blu-ray movies and DVDs to MKV container format with multiple audio tracks and subtitle sincluded. Besides retaining multiple audio tracks (especially HD audios- Dolby TrueHD 7.1/5.1, DTS-HD Master Audio 7.1/5.1, Dolby Digital 5.1) and multiple subtitles in an MKV video without transcoding and quality loss, Pavtube ByteCopy is also able to encode the original soundtracks into DTS 5.1 channels, AC3 5.1 channels, AAC 6 channels, PCM 6 channels, etc.with your wanted languages. It preserves chapter markers in the converted MKV file. All that and more make it possible for you to easily select your needed tracks, subtitles, as well as chapters when watching Blu-ray and DVD movies with your media players. And other than that, you can backup and convert latest Blu-ray and DVD movies to any other formats like MP4/MOV with multi-track audios, M4V, AVI, WMV, MPG, M2TS, etc for playback on iOS/Android/Windows Tablets/Phones, HD Media Players (WDTV), editing software (Avid Media Composer, Adobe Premiere, etc. ), and more.